Friedrich Gustav Emil Martin Niemöller, 1892–1984. German anti-Nazi theologian and Lutheran pastor. Scarce Autographed Letter Signed, Your old Martin, one page, 4¼" x 6", on a picture postcard, no place [Cala Ratjada, Spain], June 15, 1976. In German, with translation. Martin Niemöller has been described as Adolf Hitler's personal prisoner. For eight years, from 1937 to 1945, the Nazis imprisoned Niemöller in two of Germany's worst concentration camps, Sachsenhausen and Dachau, for his opposition to the state control of religion. He narrowly escaped execution, was rescued by the Allies at the end of World War II, and by the 1950s became a vocal pacifist and an anti-war activist. A conservative anti-Communist, Niemöller supported the rise to power of Hitler and the Nazi party. He explained that he “hated the growing atheistic movement, which was fostered and promoted by the Social Democrats and the Communists,” and that their "hostility toward the Church made me pin my hopes on Hitler for a while." When Hitler insisted on subordinating religion to the state, however, Niemöller became disillusioned. He opposed the Aryan Paragraph in various Nazi laws that ultimately worked to exclude Jews and other non-Aryans from both public and many private positions. Because some of his public statements seemed antisemitic, however, Niemöller has been criticized for opposing Hitler only when he feared that Hitler would attack the Protestant churches. Yet it is clear that the Nazis themselves thought him dangerous and took action against him. In 1933, Niemöller opposed Hitler's appointment of the antisemitic Ludwig Müller as the Reich Bishop of the Protestant Church. Along with Dietrich Bonhoffer, he founded the Pastorsʼ Emergency League, which sought to protect Jews who had converted to Christianity from being expelled from the church, as Hitler had ordered. He and other rebel ministers formed the Confessional Church, and he preached across Germany against efforts to bring German churches under control of the Nazis and the “German Christians,” who, like Hitler, sought to subordinate churches to Nazi political initiatives. In 1936, Niemöller signed a petition by a group of Protestant clergymen who sharply criticized Nazi policies and declared that the Aryan Paragraph contradicted the Christian value of charity. Although Niemöller did not criticize the Nazis for putting their political opponents in concentration camps, he spoke out when they attacked the church. Niemöller was arrested on July 1, 1937, jailed for eight months without trial, and ultimately tried and convicted by a "Special Court" on March 2, 1938, for “abuse of the pulpit." He was fined and sentenced to seven months in prison. Since he had already been in jail longer than that before his trial, the court released him. The Gestapo immediately arrested him again as he left the court, and he was imprisoned at Sachsenhausen from 1938–1941 and then relocated to Dachau until 1945. In an extraordinary letter to his former brother-in-law, Nazi Reichmarschall Hermann Göring, Hitlerʼs top subordinate in the Nazi hierarchy, explained why the Nazis re-imprisoned Niemöller after once releasing him. Göring castigated Niemöller: “His sentence was a mistake, and the courtʼs judgment was clouded. Furthermore the law provides that if a person is convicted and has served his punishment but again violates the law, he can be taken in protective custody. Utterances that Pastor Niemöller made at the end of his trial made it necessary for this protective-custody law to be applied. . . . The fact alone that very many enemies of Germany who always rant and write against our country are also friends of Niemöller makes one think. . . . Of one thing I can assure you: Niemöller is neither the upright man as he is portrayed by some nor a defender of the word of God. He is a querulous complainer about the state today as well as its opponent. He believes, by reason of his foreign connections, to have the right to malign our country. He enjoys here in Germany, aside from a few opponents of our state, a very bad reputation. Aside from all that, we are enjoying such marvelous days and deeds that no one cares about that little twerp." Click here to see that letter, which we sold some time ago. Niemöller has boldly written this letter in black fountain pen between notes from two others in blue. The writing is on the right half of a large picture postcard from Spain. The left half, which presumably showed the recipientsʼ names and addresses, has been removed, leaving a somewhat irregular edge. The letter itself is in extra fine condition. 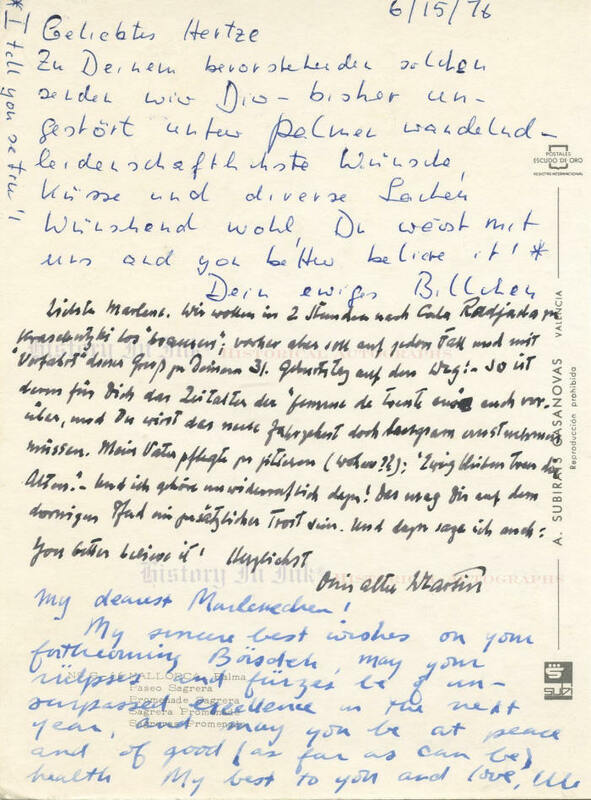 Niemöller's autograph material is scarce, particularly in handwritten form such as this. Although controversy still surrounds him, he undoubtedly occupies a large place in the history of the 20th Century German church. This is an excellent example of his holograph.